This morning I made a broad shorts for myself .I took out an old paper pattern that I drafted six years ago. The weather in Malaysia is still quite hot, but anyhow, better than the previous months. Once in a while, rain do comes but not heavy . 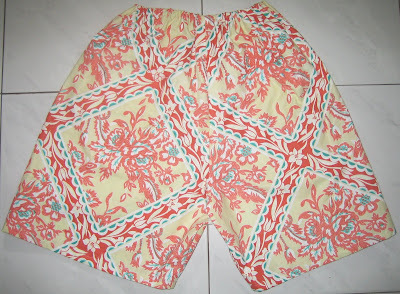 This shorts is made from cotton fabric and suitable for the hot climate in my country. Well, it is meant for indoor outfit only , because I never wear shorts when go outing, unless on the beach. An elastic band is sewn on the waist line.This makes me feel more comfy. This shorts is simple and very easy to make .I spent only about 25 minutes to complete the cutting and the sewing .